A Secret to Ageless Ageing is Skin Hydration! Weather conditions, sport activities, ill-health, stress are challenging times for your skin keeping it moist, hydrated, preventing dryness of your lips and many other kinds of skin irritations become noticeable. According to leading cosmetologists and skin specialists, premature ageing of the skin can be prevented by keeping your skin hydrated. Keeping your skin moist and hydrated is dependant on delicate balancing techniques, that take into consideration the structural integrity of the outer layers of your skin, known as the epidermis. The harsh elements of the weather during the various seasons can have a detrimental effect on the epidermis, that can lead to your skin losing excessive moisture, therefore causing your skin to become dry and itchy. For people who have a pre-existing skin conditions such as psoriasis, eczema, dermatitis or suffer in general from dry skin, will often find these conditions to worsen and the skin becoming severely dehydrated during the winter season. 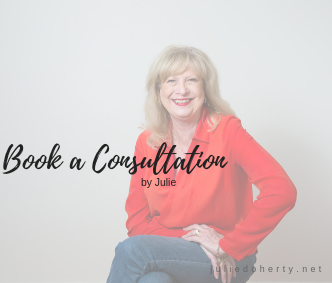 Professionally trained in both in cosmetology and naturopathic medicine, Julie advises her clients, how to treat prevent their skin from losing moisture, how to protect and heal their skin from any pre-existing skin conditions. If you are proned to dry skin it is important to avoid irritants such as excessively hot water, chemically based skin care products, soap based body washes, washing powders and detergents. Other irritants known to cause skin problems and dehydration are smoking, drinking alcohol, soft drinks, foods with high salt and sugar content. It is important that you use products on your skin that firstly contain pure ingredients, not unlike the food you eat as close to nature as possible. 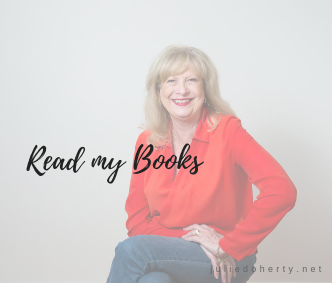 In my skin care range – “Just for You” by Julie, I include herbal medicine and pure essential oils for the treatment protocols in a pure, organic vegetable based oil or crème that is both chemically & paraben free. As these ingredients not only cause your skin to lose moisture they also absorb into your blood stream, to eventually build-up causing further skin and health problems. To offset the dehydration that indoor heating can cause it is my suggestion that you use humidifiers as they bring moisture back into the air, reducing the risk of moisture loss. Humidifiers are also a great way to introduce pure essential oils into the environment. If you are looking for a relaxed environment you can add lavender or patchouli, if you are looking to invigorate your environment adding citrus oils such as orange, lemon, mandarin and lime. Wanting to ward off negative energy adding sage and peppermint will help. Mask treatments for your skin to rehydrate – There is no need to spend money on expensive mask treatments these can be found within your pantry. Enjoying a relaxing bubble bath with lavender, patchouli and coconut oil. Then either using organic honey and or Seaweed sheets for your face and neck. The seaweed also known as Nori has all the essential minerals to help restore your skin, whilst honey restores hydration, nourishment and also acts to detoxify your skin from external toxins. Isn’t Water Enough to Rehydrate your Skin – Drinking water is important for rehydration of your skin as well as helping to remove chemicals from your blood stream. However, it is also important to both rehydrate and protect your skin externally as well. I have always lived by the motto, that I have NEVER, gone to bed with my make-up on. No matter how late! Repair & Rejuvenation Cleanser – This milky cleanser from my Just for Range, gently cleanses make-up, environmental impurities and dust. Leaving the skin feeling clean and refreshed. Deeply cleanses your skin whilst being gentle and moisturizing. Suitable to mature skin, also dry, dehydrated skin. Is gentle enough for people suffering from eczema and psoriasis. Exfoliation is important for the removal of dead skin cells, assists with improved circulation, cellular renewal and supports hydration allowing crèmes to have better absorption. Balance & Soothe – A Gentle exfoliator from our Just for You Range, that assists with deep cleansing your skin and eliminating dead skin cells, allowing for faster regeneration of new cellular growth. This helps with slowing down the ageing process of your skin. 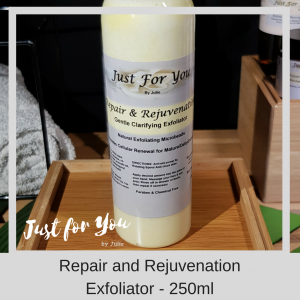 Repair & Rejuvenation – A Gentle exfoliator from our Just for You Range, that assists with deep cleansing your skin and eliminating dead skin cells, allowing for faster regeneration of new cellular growth. Specially formulated to encourage healing an rejuvenation of tired, dehydrated skin. Exfoliation helps with slowing down the aging process of your skin. It is important no matter what the weather to moisturise your skin, I believe morning and night. Depending on the clarity of your skin you may get away for a number of years with just using a day crème. However I would still apply this both morning and night. It is also important when apply moisturiser to your face area to apply the crème also to your neck and decolletage area. Balance & Soothe – Protect & Hydrate your skin with our Just for You, daily moisturiser. Vitamins A & B pure essential oils to soothe, protect and moisturise even the most sensitive of skin: Avocado, Coconut, Lavender, St John’s Wart, Chamomile, Rose, Geranium, white tea, Calendula & Rose Hip. Suitable for normal and sensitive skin. Repair & Rejuvenate – This effective day crème from our Just for You Range, will work to protect, repair, rehydrate and rejuvenate tired, lifeless skin. it will also work to improve muscle tone, skin clarity and visible reduce lines with this pure restoring formulation including vitamins A & B and pure essential oils. If you have young, non problematic skin, you may feel you don’t have the need to use a night crème. I must admit in my younger years I didn’t but as I reached the age of 40, I commenced using a night crème. The night cremes that I have formulated in the Just for You range have essential oils that will help to restore and rejuvenate your skin whilst you sleep. Balance & Soothe – Is a gentle, soothing night crème from our Just for You Range, This gentle night crème, will also help to balance out oil secretions and heal any skin problems such as acne or psoriasis. During winter it is just as important to effectively moisturise your body as in the warmer months. It just that we have to make a bit more of an effort to do this, because for the most part our skin is all covered up. This is even more reason to moisturise, because have you noticed you tend to get rashes and other skin annoyances during winter. A FAVOURITE for Healing Sensitive Skin, suffering from Eczema and Psoriasis– is our Just for You Eczema and Psoriasis Crème, you may say but I don’t suffer from eczema or psoriasis. I understand, however as mentioned my clients have found this a great crème to use throughout winter to both rehydrate your skin and to prevent those annoying rashes that seem to pop up when your body is all cover up. Previous Post: « Acid Reflux: Signs, Symptoms & What you can Do!